Next: Baked BBQ Drumsticks & Wings! It’s Wednesday! Aka Weekly-Wednesday-Recipe-with-Rachel day! Today we’re making…. Apple Crisp! Apple Pie’s beautiful, crumbly-topped cousin. Fresh, slightly tart juicy apples, sweet brown sugar, & spicy cinnamon, all underneath a golden brown buttery oat topping. + Served warm & topped with ice cream..Ohhh yeah, that’s the stuff. What I’m trying to say is– I wanted to make one more apple dessert before starting Christmas cookie baking. I love apple pie and made a few over the past month or so. And don’t get me wrong–there is never too much apple pie, but then I thought..what about apple crisp??? 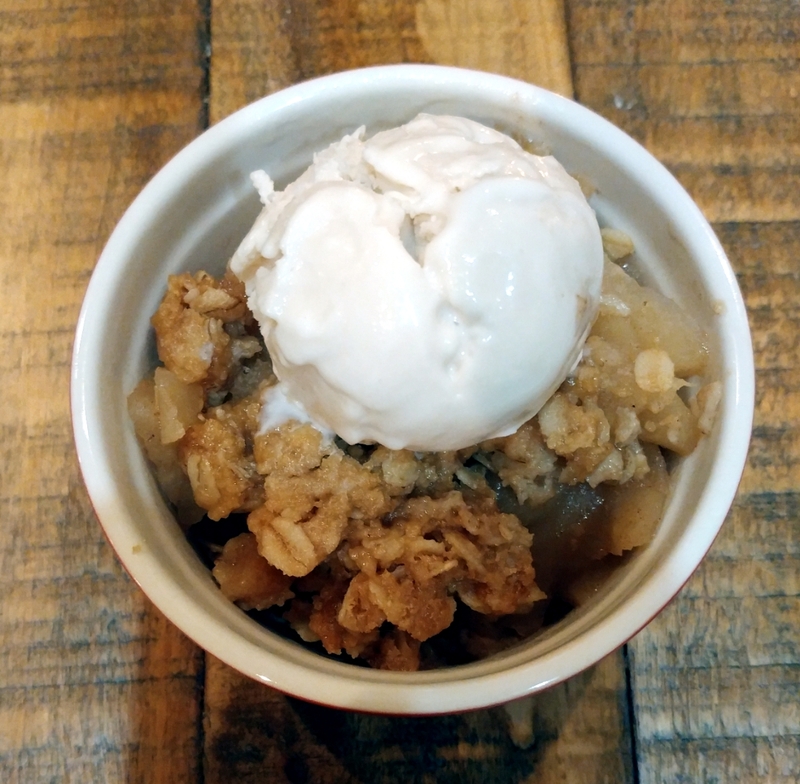 And so, an apple crisp it is! I used honey crisp apples for this one. Using a variety is usually good– empire, fuji, macs, cortlands. All will work beautifully. 1) In a large bowl, whisk together all of the filling ingredients except the apples. 2) in a medium-sized bowl, whisk together all of the topping ingredients except the butter. 3) Spray an 8×8 inch baking pan with baking spray. I actually used my 7×10.5 inch Le Creuset stoneware dish. Anything about that size will work. Set ‘er aside. 4) Peel all of the apples. Using a mandolin or a sharp knife, slice up all of the apples. Put them into the filling ingredients bowl and stir until the apples are fully and evenly covered with the sugar/flour/cornstarch/lemon mixture. Set that aside. 5) I usually preheat the oven right about now. Preheat to 350 degrees F.
6) Stir the melted butter into the oat/flour/brown sugar mixture. Keep stirring until there are no more dry spots. 7) Pour the apples into your prepared baking pan. Then crumble the topping evenly over the apple filling. Press the topping into the apples a bit. 8) Put the baking dish onto a large baking sheet. That way, just in case the crisp drips, the sheet will catch them rather than them dripping into the oven. 9) Bake the crisp in the preheated oven on the baking sheet for about 45 minutes, or until the apples are bubbly and the topping is a light golden brown. 10) When the crisp is done, take it out of the oven and cool it on a wire cooling rack. If you want to eat it right away, I’d say wait about 30 minutes, and anytime after that, dig in!! 11) Of course, I recommend serving it with ice cream, frozen yogurt, or your favorite non-dairy frozen topping. I LOVE the soy vanilla ice cream from Trader Joe’s. What have you been baking this Fall? Winter, here we come! !